Throughout his life Charles W. Newhall, III has engaged the world with ferocious intensity. The son of a World War II Army Air Corps colonel, Newhall was raised to uphold his family’s military tradition, which extends back to the Civil War. That guidance and his reading as a student at military schools instilled an ethos encompassed by warriors from all of history. 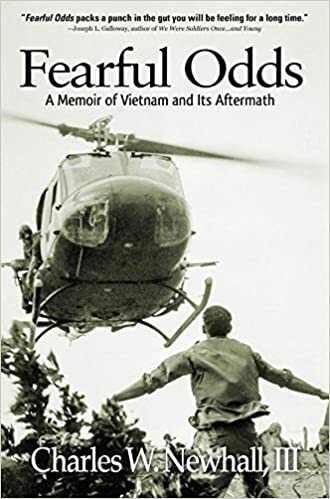 Before reading his book—Fearful Odds: A Memoir of Vietnam and Its Aftermath (Bibliotheca Brightside, 260 pp. ; $34.95, hardcover; $17.95, paper; $6.99, Kindle)—I studied its nineteen pages of photographs. They provided background that better prepared me to understand commitments far deeper than the accommodations that have guided me from day to day. The book is complex because Chuck Newhall continually poses provocative questions about values and leadership in war and peace. As a platoon leader with 1/327 of the 101st Airborne Division, Newhall spent six month patrolling the ridge lines of the A Shau Valley in 1968-69. His normal order of march was “point man first, slack man (M-60 machine gun), me.” That was Newhall’s way of setting an example as a leader. Despite Chuck Newhall’s superior military education and his strong desire to engage the enemy, twice within a week his platoon was decimated. The first time came on his third day as a leader. His Prologue describes this action, a lifetime worth of death and destruction. But Newhall seeks no solace and accepts responsibility for all that befell his men and himself. Newhall does not filter what he saw and did. He admits that his men paid back for what they suffered. He speaks of mutilating, scalping, eating flesh, and bowling with a heads of the NVA dead. He himself cut the throat of a wounded enemy soldier. The author candidly discourses on good and bad relations with superiors and subordinates. In the field, he learned and he taught. He recalled feats of historic figures such as Hannibal and Crazy Horse to guide his behavior. Like King Henry V, he strove to form a band of brothers within his undermanned platoon. During the last half of his one-year tour Newhall served as a staff officer. His highly personalized value system created difficulties in civilian life, including in his marriage. That dilemma is the crux of book’s last section. Newhall earned an MBA from Harvard and attacked the world of venture capital as zealously as he entered combat. Living in Boston amid beautiful gardens, artfully decorated mansions, and upper-crust friends, Newhall’s nights were haunted by ghosts from the A Shau Valley. He enjoyed big business success, but it soon was negated by the transformation of his wife’s personality, the collapse of their marriage, her suicide, and the unraveling of his psyche. Newhall has spent thirty years fighting PTSD. His closing chapters aim at helping others with the disorder. He emphasizes the necessity of having expert guidance—in his case, a noted psychiatrist. Most touching, he includes passages from his wife’s diary and her final note, which deal with his failures as a husband and father. Beyond all else, sharing those stunning revelations shows the depth of Chuck Newhall’s courage as a man devoted to improving the lives of others. This entry was posted in Electronic Book, Memoir, Paperback, Post-traumatic Stress Disorder, PTSD, Vietnam War memoir, Vietnam War post-traumatic stress disorder and tagged 101st airborne division, 101st Airborne Division Vietnam, Charles W. Newhall, Chuck Newhall, Fearful Odds, Fearful Odds: A Memoir of Vietnam and Its Aftermath, Post-traumatic stress disorder, PTSD, Vietnam War, Vietnam War memoir, Vietnam War post-traumatic stress disorder by vvaposted. Bookmark the permalink.